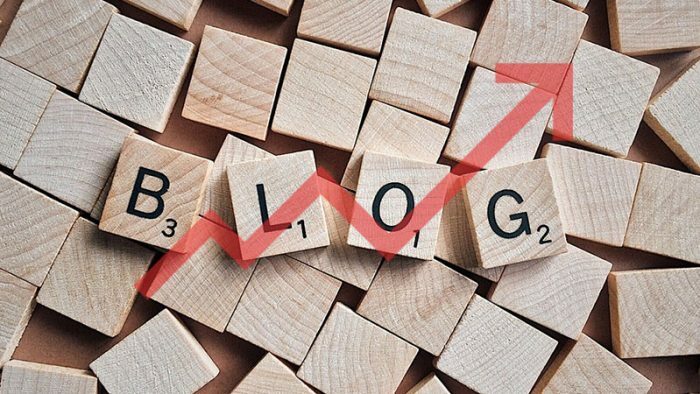 How to improve your blog’s Google Rank? What impacts Google’s decision to rank your website on the sweet top #1 page or, instead, put it somewhere on position 100? We ask this question often on SEOTalk Twitter Chat and try to go through various factors. Also, Google doesn’t tell us all that much about what influences your website’s ranking. So we can only allegedly claim that this factor or the other factor is of most importance. Well, various SEO experts and SEO-related companies tirelessly work on uncovering those factors. And, thus, to really see what your optimization efforts should focus on in 2018, we will look at insights from one of the most comprehensive and recent studies on Google’s ranking factors. Keep reading as we promise you, you’ll be surprised as we were! And much of we talk about here is based on some solid data fromSEMrush, an all-in-one SEO and digital marketing suite, that has recently published a research on ranking factors and based its findings on analysing 600,000 keywords with the help of a cutting-edge machine-learning-based system. What does the data really say? Most of us might say that SEO is a technical matter, unravelling ranking factors can also guide you, as a business owner, to invest in certain areas that don’t normally strike you as SEO-related. And the most important ranking factor, according to the study, is a proof for this. Now, don’t get absolutely confused. But the number don’t lie – direct website traffic is the most influential ranking factor, outperforming all the traditional areas like keyword or backlink optimization. This is absolutely game-changing as direct traffic was never really perceived as a candidate for ranking factors by the industry. What’s direct traffic, anyway? When the user goes directly to your website instead of Googling up your service at first, or being redirected from a Facebook ad, that’s when you receive direct traffic. This can only mean that the user already knows your brand and your website, and does not need any extra encouragement from any other channel to visit your site. That’s brand awareness and brand affinity 101, that are typically areas covered by your digital PR efforts. What does that mean for you? It means that investing in PR activities that raise brand awareness and make your brand look appealing and stand out from all the digital noise can pay off in an unexpected manner – higher rankings. This also means that putting your resources into building authority for your brand is essential. How does Google decide that you have a quality website? After learning about your authority among users (direct traffic), the second thing the search engine looks at is user behaviour. The new shift in Google’s mindset – putting people before Google bot – is already affecting the priority it places on its ranking factors. Watch out for metrics like “time on site” that reflects how much time a user spends going through the pages of your website in one session, and the “pages per session” that reveals the overall number of viewed pages. These metrics tell Google whether your content is relevant or valuable enough for the user to spend some solid time on your site and go through your domain. Thus, content optimization that often determines the quality of your website is the key to your success in this area. The fact that four backlink factors take up the fifth to eighth spots in the findings verify that, yes, backlinks are still your concern. Once again, the fact that other high authority sites link back to your pages indicate that you probably have a strong brand and great content. This leads us back to the very first ranking factor – direct traffic that is based on your PR efforts. A great PR strategy will not only provide you with direct visitors but should also help you build a strong backlink profile. In fact, bigger brands attract more backlinks than their smaller counterparts precisely for all the reasons we stated above, especially when it comes to the most expensive, or high popularity keywords. So is there a way to beat the “big guys”? There are no proven ways to do that, but you better keep trying. Given that a backlink strategy is closely related to your content marketing and PR efforts, you should really focus on these areas that should eventually naturally bring you all the benefits for link-building. You can also shift your attention to low-volume or less popular keywords, where you are likely to meet less competition on your way and get that precious attention to your content and acquire some valuable backlinks. ● Are Keywords Becoming Obsolete? 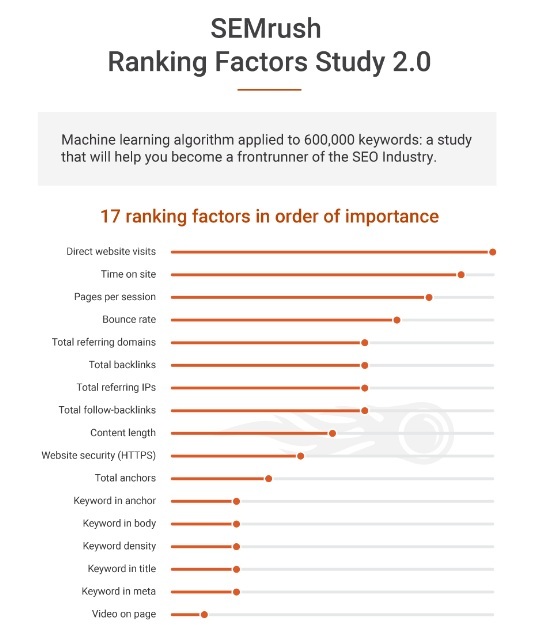 It seems like keywords, tying for the last spots for ranking factors, are losing their stance as the top strategy for boosting SEO. Is that so? After all, the entire SEO industry has been preoccupied with keyword strategy for years. And, can it be, then, that they all got it wrong? Certainly, not. But let’s look at Google and how it shifted its keyword agenda. Previously, keywords that appeared in the body or headline or keyword density had a big impact on how the search engine judged your content relevance in relation to the search query. But Google algorithms are getting smarter every day, and are now looking at semantics, or context and intent of each query and they can actually now tell what your page is all about even if the searched keyword does not appear on the page.In fact, the SEMrush’s study found that 35 percent of websites that rank for high-volume keywords actually don’t have that keyword in the title. In a nutshell, SEO strategy has changed a lot since the days when a strictly keyword-based approach could pretty much do the job and cover your optimization efforts. It might seem scary to challenge the notions that were almost axiomatic within the SEO industry for years, but you should really watch out for all the latest changes that the search giant has been implementing. Things like brand authority and brand awareness play the utmost role now for your rankings, thus you should really reconsider how you look at SEO in 2018 and cross-check your expenditures on improving your website performance with the latest findings. #NiceHeadache: Is this the beginning of a new social revolution?